There will be a presentation by Toby Heys and Panel Discussion with John Burnett, Sarah Hankins, Toby Heys, and Shahrokh Yadegari, followed by a reception. In a period that lasted from August to December 2017, the State Department of the USA began propagating information relating to so-called mysterious sonic attacks on its diplomats at the American Embassy in Havana, Cuba. Reports detailed puzzling symptoms in the victims of the alleged attacks, ranging from deafness to mild traumatic brain injury. Then, in October, a recording purporting to have captured the high-pitched sound of the supposed frequency-based weapon was made public. As waves of conspiracy theories started to emerge online – among them, that the sound was caused by malfunctioning surveillance technologies or that it was a tool of Cuban and Russian espionage – reporters from the mainstream media, including CNN, Reuters, the BBC and the New Scientist began contacting members of AUDINT. Using information gathered from these sources, AUDINT has reconstructed this weapon – an AI with the capability to create sound beams with laser-precise targeting. By taking over a facility's PA system, the AI is able to beam disorienting and even physically damaging sonic emissions at a select target. AUDINT has contained this recreation in the Gallery of the Qualcomm Institute's Calit2 facility. AUDINT, an artist collective originally formed in 1945, has spent the past nine years collectively researching the weaponization of vibration and mapping frequencies that are at the edge of perception. They have also been investigating the ways in which frequencies are utilized to question our understanding of presence/non-presence, entertainment/torture and, ultimately, life/death. The information garnered from these activities is subsequently used to produce audio recordings, computer software, art installations, performances, books and films. Dr. Toby Heys is a Reader in Digital Media at the Manchester School of Art and head of the Future Technologies Research Group. He is currently the primary investigator of 'Enlight' – A Pan-European sound and light production/residency/festival project funded by the European Cultural Fund. Dr. Heys is also a Co-Investigator on a 3D printing graphene project funded by the EPSRC. John Burnett is a multimedia artist and researcher based in San Diego, California. Drawing from a background in music composition, sound design and technology, he creates technologically-augmented, reactive installations and concert works that derive their materials from the present environment or synthesize new virtual/hybrid spaces. John is also a member of the Sonic Arts research team, based in the Qualcomm Institute at UC San Diego, where he researches audio-spatialization and audio-visual technology. John is a graduate of Oberlin Conservatory and a PhD student in music at UC San Diego. 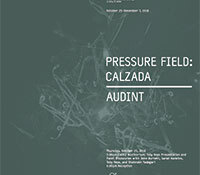 "PRESSURE FIELD: CALZADA" is open to the public from October 25 to December 7, 2018, 12 p.m. to 5 p.m. Monday through Friday. Gallery events are free and open to the public.